I’ve been thinking a lot about beer and wine the last few days. The text for my teaching Sunday was John 2:1-11. You know, the “water to wine” story. So all week, I was studying with a Bible, commentaries, computer and a glass of Cabernet Sauvignon. I keep thinking of the same things. Martin Luther spent a lot of time at the Black Eagle Tavern where he spent many evenings after supper drinking rounds of bock beer and discussion heavy and light topics with his drinking pals. For some reason, drinks and discussion go together. Our church, The Venues, has followed Luther’s lead. One of our “venues” is a downtown bar on Saturday night. On a weeknight, one of our men’s groups meets for study and discussion in a bar. 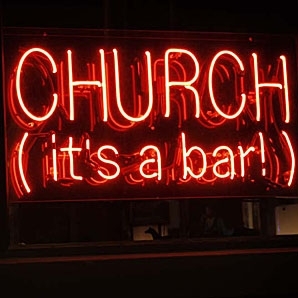 Our Sunday venue is a normal church building but our values are bar-like. Where everybody knows your name. We want to be known. And they’re always glad you came. We want to be wanted. You wanna be where you can see, our troubles are all the same. We’re all struggling with something. We create space to listen to and learn from each other. Christians don’t always listen well. We tell. But listen? Why should we listen when we have so much to say? Christians don’t always learn well from others. We instruct others. Others learn from us. You have the questions, we have the answers. You have the problems, we have the solutions. But to be bar-like is to value others opinions, critiques, insights into life and spirituality. It is to listen to others. It is to learn from others. The truth is I don’t have it all figured out. I don’t have it all together. My understanding of God, of life is continually in process. In fact, I’m a work in process. You don’t have to drink a beer to be bar-like. Some don’t like beer. Some shouldn’t drink beer.